Decorative screen doors – Budd Severino Advanced Home Exteriors, Inc.
Save on your air conditioning bills by letting us install an aluminum screen door on your front and/or side entry doors. The circulation of fresh air will keep your house comfortable in those in between season months. Our selection ranges from the plain screen door to the Elite welded security doors. These security doors have the look of wrought iron, without the hassle of scraping and painting every year. We also offer the Bahama bi-fold door for those houses with out-swing doors. All of our doors are constructed of heavy aluminum extrusion with a maintenance free electrostatic finish in white, or bronze. 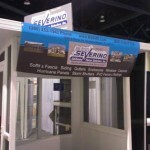 Each door is screened with long lasting fiberglass screen. For that added feeling of security, we also offer a large selection of the Elite welded series window guards.